Well here we are again with a new bus. Bought from a chap who had it in storage for the last 10 years. Thanks to Dougie we now have a little history to go with it. New fuel lines, the tank was blocked. Date of manufacture 19 August and date of MOT 19th August , it was meant to be. Looking good, can't wait to see it for real. It was bought by a tobacconist, to transport his weekly weed. Until 2001 when it was imported and sold for the Quantus make over. Then in 2005/6 it was bought from storage and by the look of things put back into storage. Until now. Then put in some new marine ply so that the interior can be bolted down. The odd thing is that it never had any internal handles for the locking cargo doors (being a panel van), so once you were inside you couldn't get out! So I have ordered a list of bits and bobs this morning and they have already been dispatched by Schofields. Oversized mirror arms to solve the dropped front doors. Engine lid spring, so I don't have to carry a broom handle around. Drivers door handle return spring. Cool bus, cargo floor looked good. Carpet is nice in the back but not so good wen you're camping. Look forward to seeing how you configure the interior as it's a double door. Cargo floor was better than I thought so thats a positive, it's has some rust on the edges but nothing serious. I didn't paint it as the interior will come out when we do the sills etc. I shouldn't order parts at work, the engine lid isn't a missing spring now it's arrived. It just doesn't hold against the tab. Then I try to install a new door handle spring, to stop the ice pick attacking passers by. There are obviously different spring sizes. Then got started on the over sized mirror arms to solve the door sag. The drivers door was simple but the old passenger door one will not budge. I'm having one of those days. But the interior is in. Last edited by W-W on Sat Aug 27, 2016 4:59 pm, edited 1 time in total. And the curtains are made and are in. Oh and because it was a panel van the cargo door locks aren't long enough to attach interior handles. Nothing I ordered has fitted. 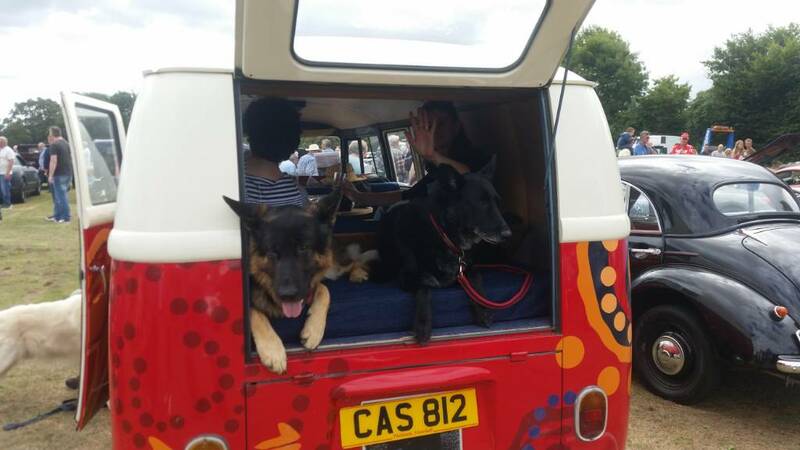 Just to keep the thread alive, here is the protection squad looking after her at a local classic car show. Having great fun with the brakes this year, after popping a seal on one of the front wheel cylinders, I replaced all 4 and swapped to a dual master cylinder. All working for about 5 miles, now I've popped a rear cylinder! I had similar. Replaced the MC and leaking slave cylinders in three of the four drums. The fourth was fine. Had a look when I took the transaxe out at the back end of last year and the one I hadn't changed was leaking. The weakest link fails.